Some of you might remember that my nearly 30 year old Craftsman circular saw smoked during the beginning of building my wife’s garden shed. 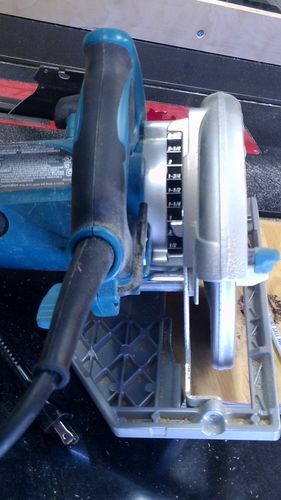 I was looking at a couple different saws, but based mostly on the recommendations of several LJ’ers who probably are more up to speed on such things, I spent the little extra to get the Makita 5007MG. I have to say that this was probably one of the best out=of-the-box products I’ve purchased. It has adjustments to get it aligned, but after careful checking, I didn’t have to adjust anything. AND…. I figured I’d see what I could get out of the stock blade. As most of you have experienced, the stock blade on most saws is crap. This one is actually not bad at all. I figured I’d use it to test it and then put the Diablo on, but so far, it’s cutting smooth so I left it alone. Might be one of the best stock blades I’ve experienced. It has cut framing, roof sheathing, and today, plywood soffit. Now I am admittedly not a framer, and I am admittedly kinda doing some things that may not be considered “normal” so on the downslope edge of the soffit, I cut a bevel to get it to fit tighter to the facia. I’m following the roof rafters, not using horizontal nailers. The guide on the saw’s shoe showing where to expect the blade to track at different angles really worked well. Nice touch! You might notice the nice big locking handle for the bevel adjustment. It’s a rubber-grip over metal. VERY easy to operate and locks solid. The round-ish blue knob on the left actuates a mechanism to give you positive stops at some common angles. Easy enough to look up the specifications, but I’ll tell you this is a HUGE improvement over my old saw. It’s not as light as the lightweight Dewalt, but it FEELS light in the hand. It has good balance, power, and surprisingly less “kick” when you start it (as compared to my old Craftsman) even though it feels much more powerful. So… comes with a nice case (not all of them do any more), the lock levers are beefy and grippy. It has some nice indicators and features AND…. it does NOT have that stupid “safety button” that you have to press with a thumb before you can squeeze the trigger. That button drove me nuts for almost 30 years. I would definitely recommend this and I can see why so many LJers recommended it to me. So thanks to everyone who responded to my thread about buying a circular saw. This turned out very well and didn’t break the bank. Thanks for the review. My circular saw is terrible. I’ve been looking to upgrade. I might go with a track/plunge saw. If not, I’ll give this one a look. Good for you, Charlie. I love mine. How dose the saw do when using an panel guide? Not the rip fence. Good review. Thank for sharing your thoughts. My 30+ year old Skill saw is showing signs of wear. I looked at the Bosch and Dewalt. I’m a Bosch fan based on owning a few of their routers and jig saw. The Dewalt is light weight and has had some good reviews. I’m going to look at the Makita as well. I’m impressed these days when you buy something that works as advertized straight out of the box. I can help with that answer. 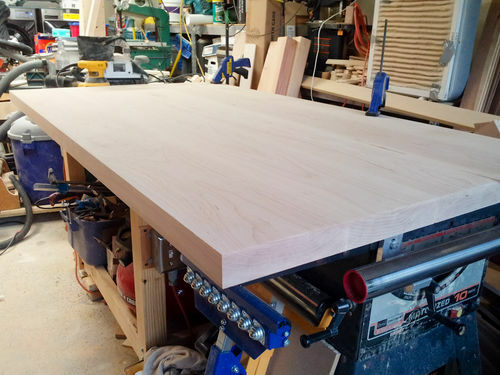 I built a table top out of 8/4 maple. I used this saw with a shop made guide to rip and crosscut the top to it’s final size. The blade I used is the 60t diablo thin rip bought at HD. The saw worked great and the result was very smooth. See pic below. Not bad at all. My Skil is about 15-17 years old and has that dreaded button, plus shoots chips right into my face. Hate it and avoid it whenever possible. Might have to look into this Makita! I’m happy you like the Makita. The construction company that I used to work for used no other saw. I always felt that safety button was for those who were not very comfortable around a saw. For me I felt less safe having to have my thumb on that instead of firmly holding the saw. browsing whats out there. I gotta tell ya, their are a bunch of nice saws out there for less than 100 bucks. I saw at Lowes recently. it and it does ok. The biggest issue is the bevel adjustment is a wing nut that you have to hammer to loosen it and hammer it to tighten it. The depth adjuster lever is kind of small also. But other than that, it does everything I ask of it. Not sure I need my circular saw to cut through 2 or 3 inches of hardwood. Thats what the table saw is for. I purchased same saw to use on my EZ Trac System and have never been disappointed with a cut it’s made. I have that saw also and am very happy with it..I will say the only small issue I have is that the blade guard will stick sometimes and you have to use the thumb lever..That can be annoying.. I bought this saw and love it but it does have a flaw. When I use a tri-square to crosscut with it and the saw is at max depth the motor housing hangs up in the lip of the square at the end of the cut. 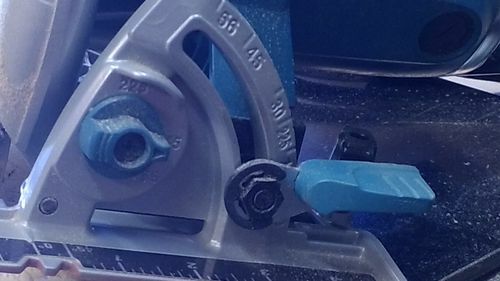 A friend has another version of the Makita saw (not magnesium) and his motor housing has a little bevel at the end so it doesn’t get hung up. WHY does the cheaper version have a better design feature? It’s not something I ever would have thought of until I used his saw back to back with my own.